Just as John longed for his readers to see Jesus as the tangible Divine communication of God’s love (see notes on 1 John 1:1), he also wanted us to see the Christ as a deliverer. He wanted us to understand that Jesus did far more than just communicate God’s love, He became the Divine personification of love upon the cross. It was nothing less than the God/man Who gave us “life”. Whenever a biblical writer uses the same term twice within the same context, it is important that we take note. In the first phrase of 1 John 1:2, the apostle tells us that “life” came. In the second use of this term, he tells us that “life” was proclaimed. Because of His coming, our proclamation takes on new importance. No longer is our announcement limited to a coming Savior, we tell of One Who has already been here. In addition, the second time the word “life” is used, we find that it carries with it the very important modifying word “eternal”. Ours is not just a hope for this life, but a confidence in the life to come. Notice the words of John toward the end of this book, “I write these things to you who believe in the name of the Son of God so that you may know that you have eternal life.” (5:13) By John’s own admission, the very purpose of the book of 1 John is to give us certainty of eternal life through the God/man, Jesus Christ. When Gabriel was a small boy, I remember carrying him on my back through the parking lot at Lowe’s. The air was frigid and it stung my lungs. Even with gloves, my hands felt the cold as the arctic breeze raced around me. Some of it found its way up my coat and a shiver raced down my spine. Gabriel buried his head in the back of my neck while the wind pulled at my ears. I felt the strain from his weight and thought about letting him down. He loved to ride on my back and I loved to carry him, but sometimes this old life makes even the joys hard to bear. That is why I so love the book of 1 John. To be honest, my present life isn’t all that bad, but when I think of the “eternal life” to come, this life seems like little more than a teaser. I can’t wait! Are you going? Do you “know that you have eternal life”? For assurance to be sure, we must let God speak for Himself. We must be true to the inspired context. After each study, read the entire chapter again taking note to the way today's verse relates to all the verses around it. Due to the colorful, complex nature of the original language, the best translation is multiple translations. Following each lesson, this chapter will be presented in a different translation. Below, we have featured the English Standard Version. Missed the first two parts of this study? Check them out! 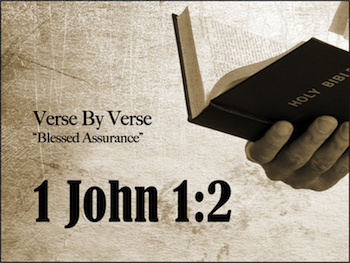 "Jesus - Word of Life: 1 John 1:1". Back to Top of "Jesus - Eternal Life"